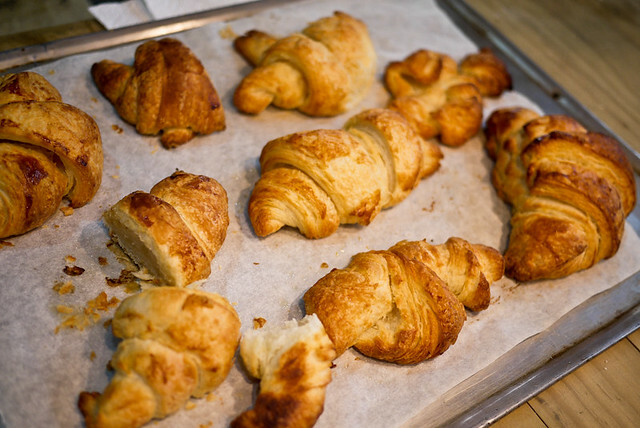 Prior to attending baking school, I would just munch a croissant until it fully disappears without giving much thought on how it became like that. I just didn't care. But after hours of repeatedly folding and rolling the croissant dough, I promise I'll never look at a croissant the same way again. Since I cannot attend our Laminated Dough class on August 17 (Saturday) because of my out of the country trip, I took it during the Monday class. Jo Anne is also joining this class because she won't be around on that day too. I felt relieved that I know someone from the class in case the weekday class will bully me not be as friendly as my classmates. I was on the verge of crying while waiting for a cab on the way to school. I was already late and if I can't attend it, there's a possibility that I cannot complete the course in time for our graduation since I had to wait for the next intake. I came to class an hour late and everyone was already doing their mise en place. I approached our teacher, Chef Carlo, and said sorry that I was late. He just nodded and told my classmates to tell me what to do. We were asked to do the quick puff pastry individually. While I was still figuring out what to do, I observed the weekday class and they were doing it fast. Good thing Anne was there to help me and assist me on what to do. I was just halfway done with my rolling when Chef Carlo started with his lecture. And so I had to multitask. While my classmates were sitting comfortably, I was standing, rolling my dough while trying to keep up with everything our teacher says. The lecture finished just as I was wrapping my dough. 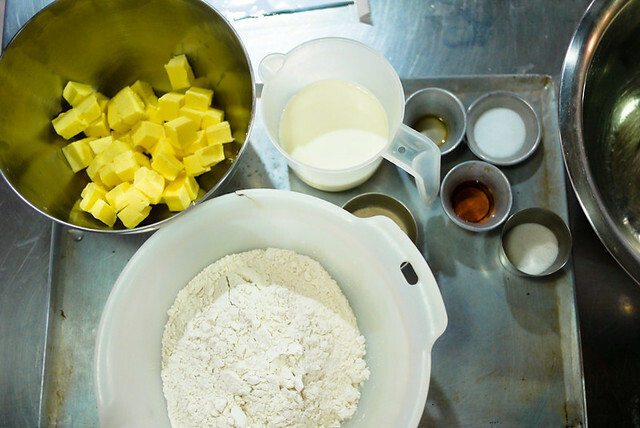 And then we were grouped into 3 and asked to do the mise en place for our next assignment. Yes, the class was so fast paced I felt so lost. 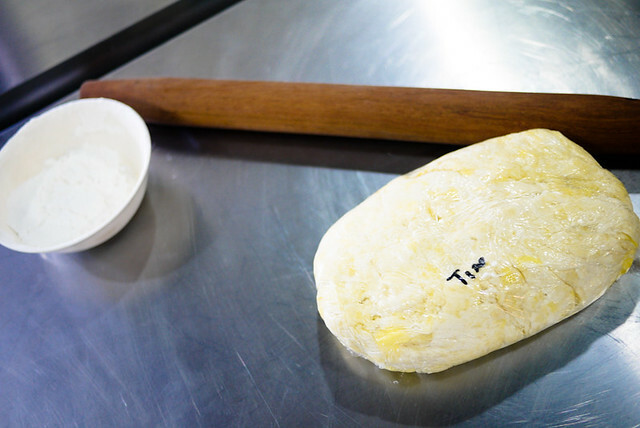 Aside from our individual quick puffs, we were divided into 3 groups to do the rest of the laminated dough. Anne and I were assigned to do the croissant while the two other groups did the danish and classic puff. 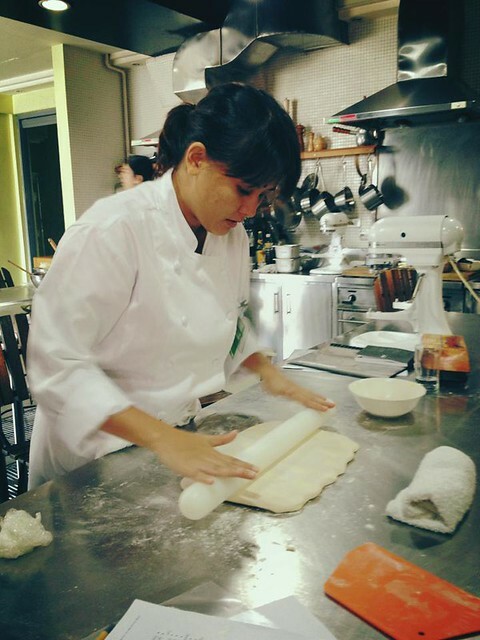 Before doing our croissant, we found out that it was a series class and that all the rolling and folding will be done today and baking will be for the following day. And so Anne and I were forced to commit to attend on the Tuesday meeting. 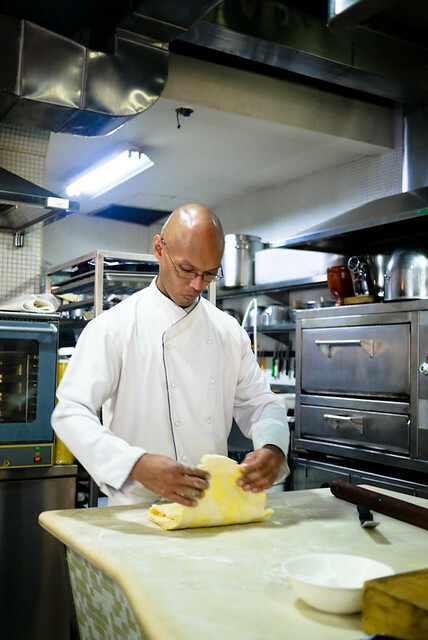 While we were busy, Chef Carlo was doing his own thing. He would call our attention from time to time to describe what he's doing and send us back to our work table afterwards. We were also taught how to operate a dough sheeter. 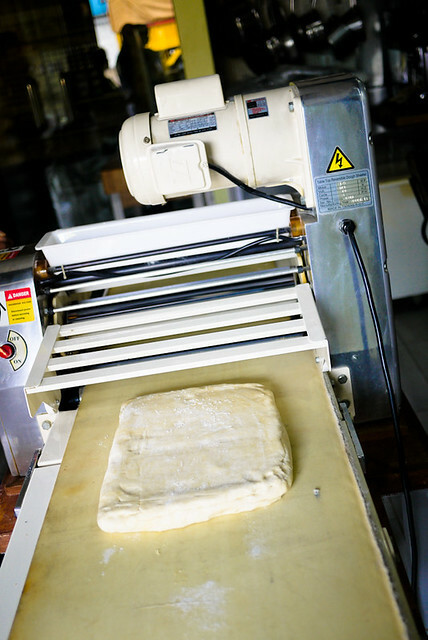 It works like an automatic rolling pin and you can set your desired thickness. All we did was roll and fold and roll and fold the whole day. We put all our dough in the fridge to rest overnight and then we were dismissed.